Shorter wait time – Compared to traditional referrals, a referring physician that a patient sees (nearer and more accessible) can help to capture, store and transmit the patient information and skin images to a dermatologist. The access to a dermatologist is therefore faster. Accessibility for patients who live in areas without dermatology care – Singapore is small but in many other countries, specialist dermatology department may only be available in certain areas and teledermatology is a way for patients living in more remote areas to have access to specialist care. Familiarity – For skin issues that both the referring clinician and the dermatologist feel that it is appropriate for the dermatologist to prescribe a skin management plan and the referring clinician to administer and be responsible for the patient interaction and care, the patient will then be seeing the same doctor (referring clinician) who he/she has already established a relationship with. Convenience – Potentially faster, cheaper and less stressful than to travel and visit another doctor. More detailed record – As the process of teledermatology is reliant on the transmission of patient information, images and then the relay of the diagnosis and treatment plan, followed with the outcome of previous treatment, there is a well documented record of the patient information and the skin condition. This record may be more detailed in in-person consultation. Reduction of waiting lists at dermatology clinics – As certain skin conditions do not warrant establishing a relationship with dermatologist but rather straightforward in the diagnosis and treatment, the waiting lists at dermatology clinics can be shortened. If traveling to the dermatologist is not an issue to begin with and the mode of teledermatology is video conferencing, there may not be much cost/time-savings involved. 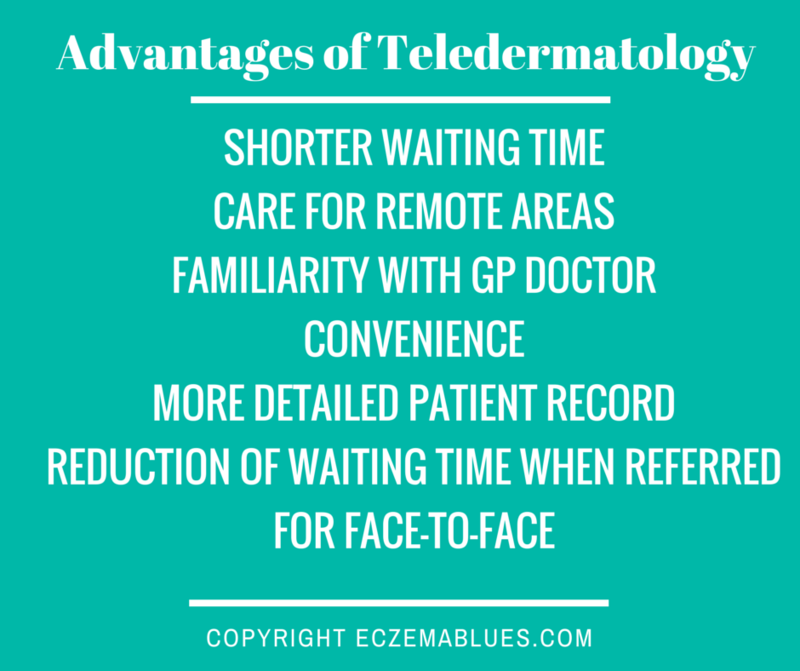 On the other hand, it benefits certain situations such as elderly living in a home who may not have access to specialist care if not for teledermatology. If you want to understand more of the quality standards in teledermatology, do read British Association of Dermatologists’ standards. Share in the comments if you have benefited from teledermatology and what advice you have for patients to get the most out of it, your sharing will help another! It’s good to know that there are options for people who aren’t able to access dermatology care, as you said. My husband and I live in a rather remote area, and he has some moles we’re concerned about that we want to have looked at. Overall, teledermatology seems like a good option for getting him checked out, as you said, and it’s good to know that it gives a more detailed medical record, as well. Agree and I live in Singapore, it is a small island with lots of GPs and dermatology care physicians but even then, I have heard of parents who turn to dermatologists overseas who offer online care and support. I can only imagine how much more online/phone/video consultation would be helpful in a big country like Australia especially at places where it is so much more difficult to travel. Hope that more people can get the care and support that they need for their skin and eczema.